warm person, although not extroverted. Her innate cautiousness, thoughtfulness, secretiveness and suspiciousness prevents her from wearing her heart on her sleeve. You can check out her hand photo here. An interesting personality trait of Roberts is that she is very diplomatic and smooth, and one of the reasons for this is that she is extraordinarily perceptive and sensitive to what others feel, and therefore would not show her true feelings. She does not like to hurt others and will herself find it difficult to stay in a relationship where the other is not sensitive to her moods and her feelings. She is the type who is likely to develop a public persona which is quite different from her private one. She would guard her privacy as much as she can. She is not perfect and a not so pleasant aspect of her personality is revealed by the strong development of the lower mount of moon. Although she is not the melancholy type, there is some sort of negative imagination at work and it make her wallow in misery at times. Her hand shows that she can be controlling and manipulative. The good thing is that Julia Roberts is not an attention-seeker like so many celebs, and is not the type to ever get addicted to fame. Lot of talent is shown on her hand, and her dedication to her craft, intelligence, and a sensitiveness to the environment and to others all add to it. Julia Roberts is an introspective person, and a thinker. An actress with a strong mind. She is known to be a converted Hindu but her hand does not show her to be religious. She may believe in a higher cause very deeply, but religiosity is not shown on her hand. She would be very down-to-earth about her beliefs. Generally speaking those who convert can become obsessive about their new religion, but Roberts' hand does not show this. Related Reading: Michelle Yeoh's hands show her to be different or Nicole Kidman's hand reading or check out the hand analysis of other Hollywood celebrities. I did not know that Julia Roberts is a Hindu. If she is not religious, then I think it explains why she converted! In Hinduism there is no pressure to go to temples or to perform rituals. As a good Hindu you can be an agnostic and still remain within its fold. Even Buddhism is something similar. In fact in Buddhism you can be atheist. I know what you mean. One is quite free in Hinduism. I wonder if that is why she converted. 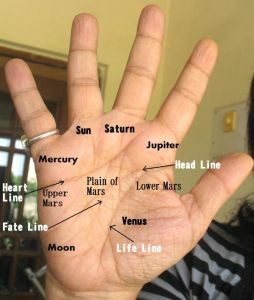 Looks like a very positive hand-reading! Such people will be mostly stable and will not break down even after they age. It's good for her. Yeah that's true, she will be happy even after the fame has ended. Julia is analysed as an infp. i sam also sure bout that too in me. When i read bout her, she is as much as me. I think it is not introverted. It is ambivert. I am studying homeopathy. It is very sure we both having tubercular miasm.